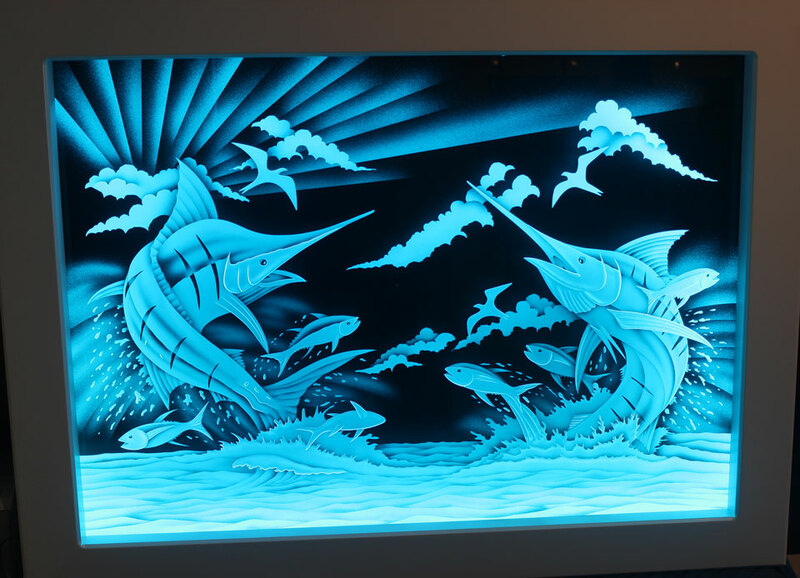 Peter Edward Jurgens, a master glass artist celebrating 30 years of art glass in South Florida, was recently commissioned to create a custom LED illuminated art glass piece for JB’s on the Beach in Deerfield Beach, Florida. The hand-made piece features hand carved and etched glass illuminated with LED lights. "Everyone loves it," said Scott Moen, General Manager of JB's on the Beach. 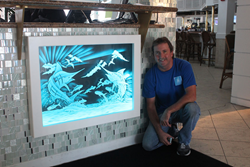 Peter Edward Jurgens, a master glass artist celebrating 30 years of creating fine art glass in South Florida, was recently commissioned to create a custom LED illuminated art glass piece for JB’s on the Beach in Deerfield Beach, Florida. The hand-made piece features hand carved and etched glass illuminated with LED lights. The custom artwork was created by Jurgens featuring two jumping marlin fish swimming in the ocean with several smaller tuna etched and carved into the glass. 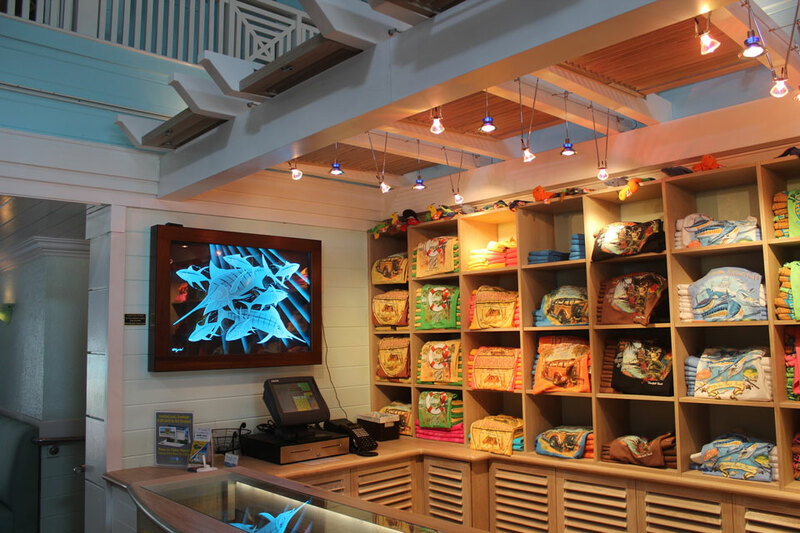 The design is perfect for the popular South Florida beach-front restaurant and bar. “A lot of my South Florida clients request nautical art glass and fish designs because of the awesome fishing and beautiful beaches here,” said Jurgens, president of Krystal Glass Company, http://www.krystalglasscompany.com in Pompano Beach, Florida. The custom LED illuminated art glass is 40” x 30” and was created to the client’s exact specifications right down to the custom hand-made white frame that hangs the eight color LED illuminated art glass in the restaurant’s foyer. Guests at JB’s on the Beach are now greeted by more than just a friendly face at the door. The piece lights up the entryway of the recently renovated restaurant and bar. The color changing LED lights can slowly rotate through all eight colors or display just one. General Manager Scott Moen commented on the LED illuminated art glass saying “Everyone loves it”. A second piece of carved and etched LED illuminated art glass by Peter Edward Jurgens is on display in the restaurant’s new gift shop. Moen liked the commissioned piece so much that he offered wall space to Jurgens to help promote his work to the thousands of customers that JB’s on the Beach serves each week. The piece in the gift shop is also a nautical design of game fish and a similar size. Customers can order any size, shape and design. The Krystal Glass Company art glass project was part of a major interior renovation at JB’s on the Beach. JB’s on the Beach is located at 300 N. Ocean Blvd., Deerfield Beach, Florida. Peter Edward Jurgens, president of Krystal Glass Company in Pompano Beach, Florida, is a master glass artist with a 30-year history of creating thousands of custom art glass projects by hand in etched glass, carved glass, illuminated glass, painted glass, antique mirror and decorative mirrors. His art glass and mirror grace the luxury homes, yachts and offices of clients in his hometown of South Florida and can be shipped to any location. He is well known for highly detailed etched and carved glass designs rich with multi-shaded areas that he achieves by hand. Most of his commissions come from referrals and repeat clients. Krystal Glass Company has been family owned and operated since 1980.